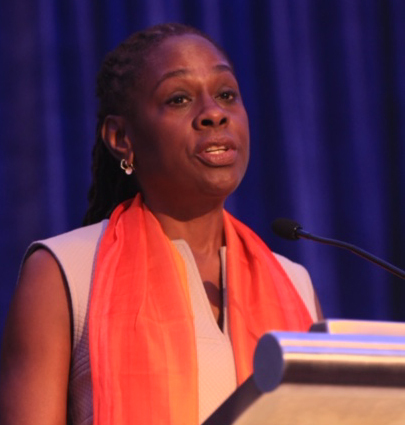 “Our mental health moment is now,” said New York City First Lady Chirlane McCray in a passionate Opening Session address at APA’s fall meeting, IPS: The Mental Health Services Conference, being held today through Sunday in Washington, D.C.
Change the culture: It’s time for New Yorkers to have an open conversation about mental health. Act early: New Yorkers need more tools to weather challenges and capitalize on opportunities. That can happen through investment in prevention and early intervention. Partner with communities: By embracing the wisdom and strength of local communities, effective and culturally competent solutions can be created through collaboration. Use better data: Better data mean better treatment, better policies, and better interventions. Strengthen government’s ability to lead: New York’s government has a responsibility to support mental health. “We’re taking that seriously by serving as the clearinghouse to drive change,” states the website. McCray also spoke of her own family’s experience with mental illness when her 18-year-old daughter required treatment for depression, anxiety, and addiction.